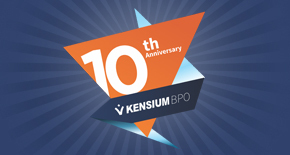 Kensium BPO has entered its 10th year of serving customers in legal and administrative professions. Over the past decade, Kensium BPO has grown from a new-born entity of a new company to a solid foundation on which a company can rely. Now with hundreds of employees in locations across the globe, Kensium BPO is as strong as it ever has been and continues to flourish. Providing legal and administrative services to all of our loyal customers has been an honor. We can’t wait to continue our relationships and form new ones. Everyone at Kensium BPO is humbled by the success and support we’ve received over the past 10 years. Let’s make the next decade a great one too!